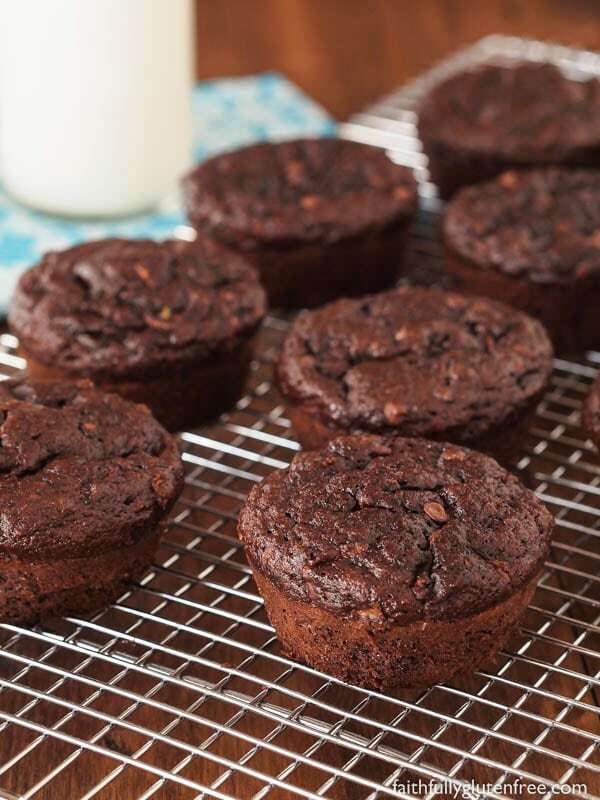 These fudgy gluten free Double Chocolate Zucchini Muffins sure don’t taste like a healthy treat, but they are. A great way to use your zucchini bounty. If you still have a few zucchini tucked in the back of your fridge or freezer, now is the time to take them out and use it. 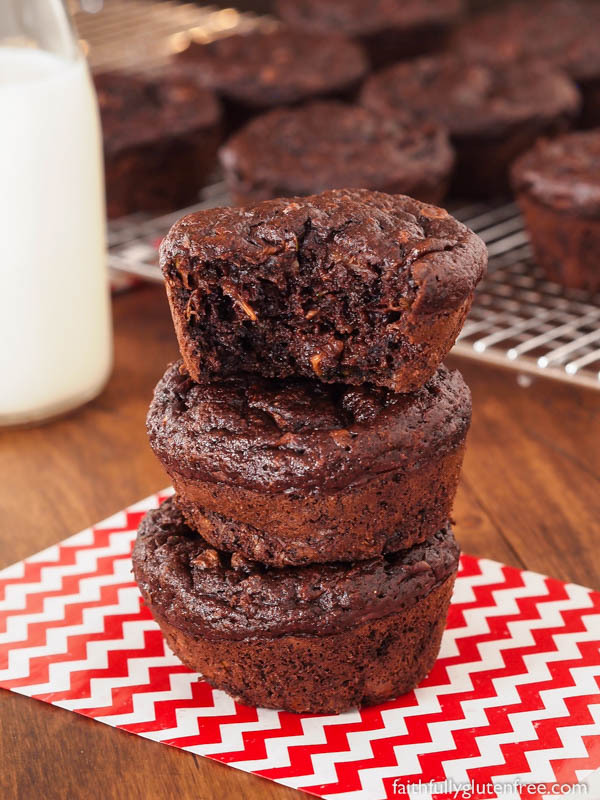 This muffin will leave you with no guilt when your child asks for seconds or thirds. My kids like these muffins so much, seldom do they even make it past the second day. 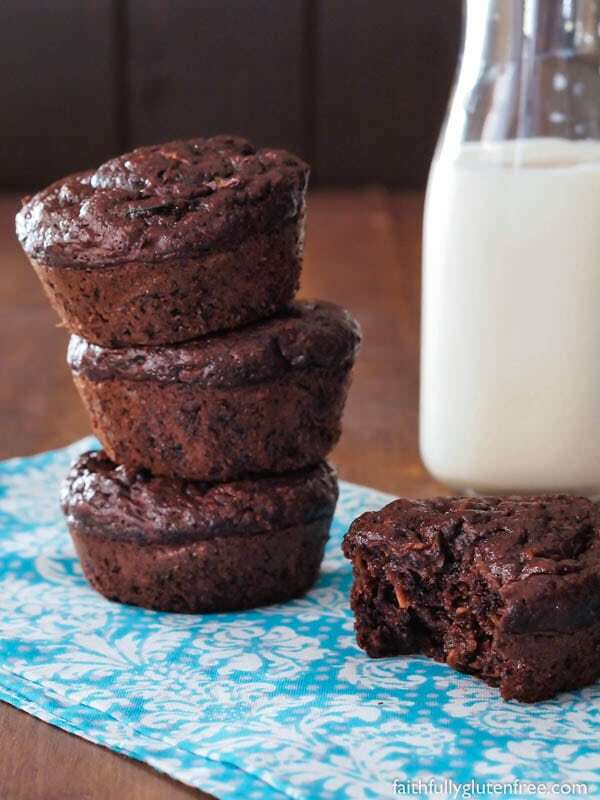 These gluten free Double Chocolate Zucchini Muffins are such a hit, in fact, that my son actually asked if he could bring them to school as the treat for his class on his birthday this year. Yep, that good! 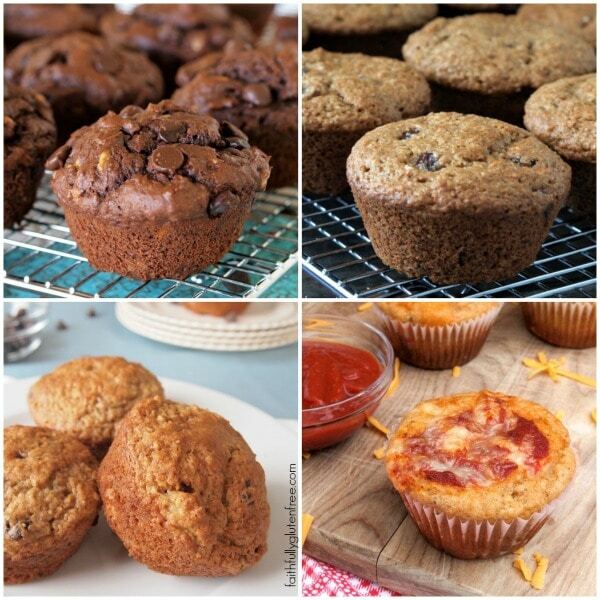 These muffins have worked their way into my favourite “Top 5 Muffins”. Give them a try, I think you’ll love them too. To peel the zucchini or not? If you are using young, garden-grown zucchini, there is no reason to remove the peel before shredding the zucchini. However, if you have little detectives that may wonder what the green flecks are, you may want to remove the peel. If you are using a store-bought zucchini, which has been sprayed to extend the shelf life, or a large garden-grown zucchini, you will want to peel the zucchini before using, as the skin can be tough. 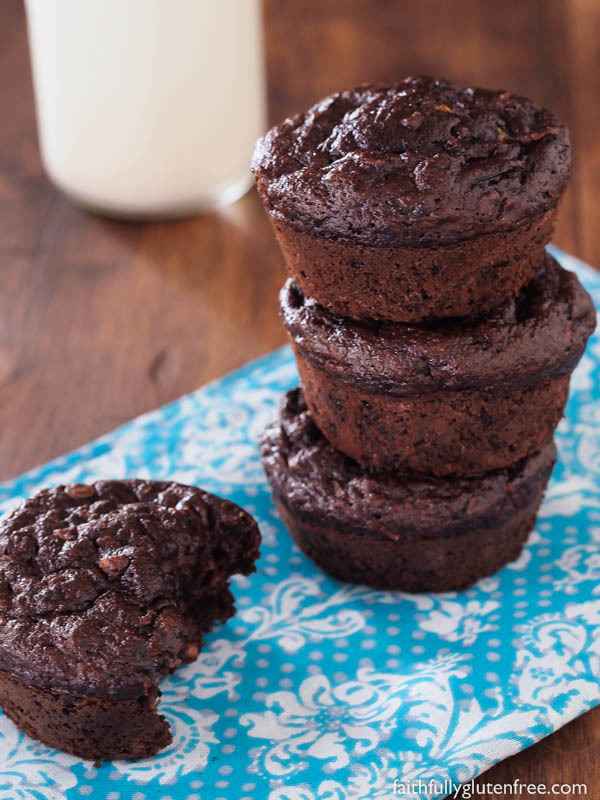 These fudgy gluten free Double Chocolate Zucchini Muffins sure don't taste like a healthy treat, but they are. A great way to use your zucchini bounty. Preheat the oven to 350 degrees F (175 degrees C). Lightly grease a 12 cavity muffin pan, or line with paper liners. 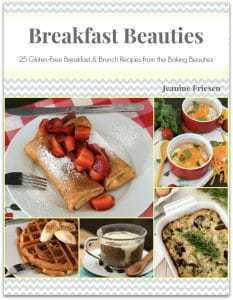 In a large bowl, whisk together the oat flour, tapioca starch, cocoa powder, baking soda, xanthan gum, cinnamon/espresso powder (if using), and salt. Stir in the melted coconut oil. In a separate bowl, whisk together the sugars, milk, apple sauce, eggs, and vanilla extract. Stir the wet ingredients into the dry ingredients, just until incorporated. Add the shredded zucchini and mini chocolate chips, and stir until evenly distributed. Bake in the preheated oven for 20-25 minutes, or until a toothpick inserted into the middle of a muffin comes out clean. Allow the muffins to cool in the pan for 5 minutes, before removing to a wire cooling rack. Cool completely before storing in an airtight container. Which other muffins make my Top 5 Favourite Muffins? These muffins sound wonderful. But I don’t have coconut oil. 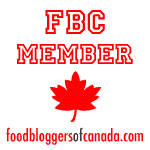 Can I just use canola oil? Absolutely, Jill! Works just as well. Just mix it with the wet ingredients, and you’re good to go. If I use the Thomas Keller’s cup4cup flour, instead of the oat flour do I still need to use the tapioca starch and xantham gum? Or without the oat flour they would not be the same??? Just made these and they are wonderful and easy to make. My 4-year-old son was very recently diagnosed with Celiac Disease, so I’m just starting out on this new food journey with him. He’s also a Type 1 diabetic so it’s especially nice to find some healthy gluten-free goodies. I’m looking forward to trying some of your other recipes. Thanks for sharing!